DriveWorks software is used for Design Automation and Sales Configuration by companies. Whether you are an engineer that needs Design Automation to automate your SOLIDWORKS models, Product Configurator and Guided Selling. Included in every license of SOLIDWORKS. You’ll find DriveWorksXpress under the SOLIDWORKS Tools menu. 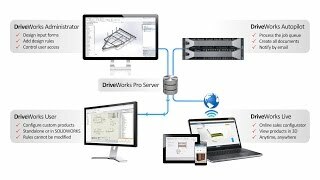 DriveWorksXpress provides entry-level Design Automation inside world-leading, 3D CAD design software, SOLIDWORKS. DriveWorksXpress is ideal for everyday repetitive design tasks. Use it to create multiple variations of SOLIDWORKS Parts, Assemblies and Drawings quickly and accurately. Save time, reduce repetitive tasks and minimise costly errors. 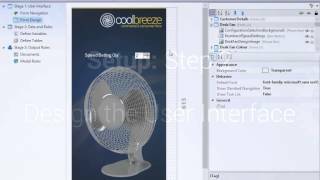 DriveWorks Solo is Design Automation software which allows you to quickly and easily create and configure custom products inside SOLIDWORKS. Use DriveWorks Solo & SOLIDWORKS to reduce the cost of custom designs, respond quickly to sales enquiries, enhance product quality & reduce repetitive tasks. 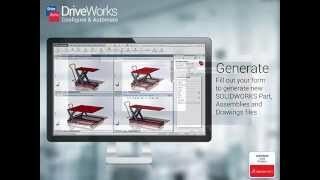 Setup and use DriveWorks Solo in the engineering department to generate the 3D Designs, detailed manufacturing drawings & quotes for each new order-specific design. Enter new dimensions or order specific details into your own custom forms inside SOLIDWORKS for each variation required. The output is all the information required to manufacture and market product variants. Quickly and easily create and configure custom products Generate your SOLIDWORKS Parts, preview and generate quotes to help you respond quickly to enquiries from your sales team. Harnesses the power of SOLIDWORKS so you can preview the effect of your selections and see the changes to your design before finalizing your design. Design your own forms, to help you configure valid permutations. You can even add your own rules-based form-to-form navigation to help you move quickly through the forms depending on what options you need to select. Let you copy information and then save it in Solo so that that data can be re-used in your project on the forms and as you build the rules for your custom designs. Linking the values entered on your DriveWorks forms to the rules and data inside DriveWorks Solo, you can provide a fast response to sales enquiries from your sales colleagues and customers. Use DriveWorks locally or on the web Easily automated with the DriveWorks Pro add-in software. You decide what you want sales people and customers to be able to configure and create, such as Dimensions, Features, Custom Properties and Drawings. Improve your sales and marketing with a custom Online Product Configurator. Reduce the time it takes to respond to customer enquiries and will help you win more business fast. 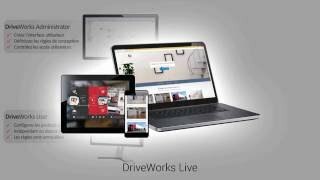 Provide Product Configuration and Guided Selling for your own teams, Distributors and Dealers, DriveWorks software is modular and scalable so you can set up and use the products to your advantage and at your own pace. Incorporates its own Form Designer making it very easy to create great looking forms and interfaces for entering product requirements. create Documents such as Microsoft Word, Microsoft Excel, or HTML files for use as Quotations, Covering letters, Delivery Notes, BOMs, etc. 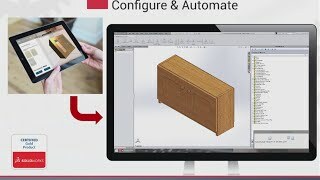 Whenever a SolidWorks Part, Assembly, or Drawing is generated, DriveWorks can also save the model or drawing in a variety of other formats, for example, eDrawings, DXFs, PDF and so on. Rollup data tables – automatically sync information from child specifications.